From a quarter-acre to twenty acres, Rochester Lawn Care uses specialized propane powered mowers with 52” to 61” decks to cut the turf at a specified height to provide a beautiful, well-maintained turf area. Turf is normally cut at a height of 3” during the normal growing season with the last cut in the fall done at 2” to prepare the turf for winter. Mower height can be raised for certain drought conditions or lowered for a specific purpose or appearance. 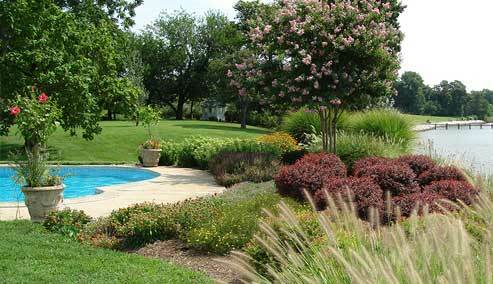 We provide residential landscape care and commercial landscape care services throughout the Rochester NY area. Blow all beds, removing leaves & debris from winter landscape. Hand-rake worst areas of lawn. Rake away dead foliage from perennials in beds. Put back sod in areas damaged from snow plowing. Return stone/gravel to its proper location after the winter's snow plowing ends. Stone is available in assorted varieties and colors. A specialized machine is used to put furrows in the soil or existing turf and drop grass seed in the furrows. The machine then covers the furrows. This process is used to renovate existing bare or weak lawns without requiring total reconstruction of a new lawn. It's a very economical way to revitalize an existing lawn. The best time for this service is in the spring or early fall. A specialized machine isused to remove plugs of soil and deposits on lawn. Rainwater flows into the holes. Grass roots grow to the bottom of the hole to get to the water. The best time for this service is in the early spring or late fall. A special machine is used to deeply rake turf areas to remove dead and undecomposed organic matter build up. The purpose is to promote the grass plant to root in the soil and not in the organic matter which makes it more susceptible to extreme environmental conditions. A half- inch of thatch is actually beneficial for your turf.